Hello Frndzzz.... www.dealsnloot.com Back With New Dominos Pizza Deal. 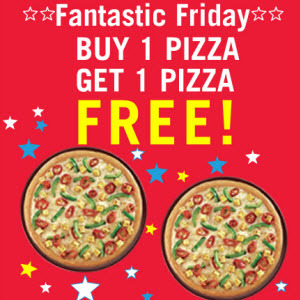 Domino’s offering Buy 1 Get 1 Free on Medium pizza & Large pizza when apply code MOB06. Offer is valid for today. Offer not valid on Simply Veg Pizzas, Simply Non-Veg PIzzas, Regular Pizzas, Combos, Beverages, Desserts & Fresh Pan Pizzas.